Vendor onboarding is the process of gathering the documents and data needed to set up a company as an approved vendor or supplier and to enable your organization to efficiently conduct business, purchase goods and services, and make payments to that company. Vendor on-boarding also requires vetting and validation to insure the prospective vendor is compliant with laws, regulations and your corporate standards. We understand that the processes and tasks associated with vendor onboarding and administration is often a complex, multi-step process that spans several departments and requires a solution that facilitates time-sensitive collaboration. The vendor onboarding process generally requires input, review and/or approval from procurement/purchasing, risk management, legal, finance, logistics, accounts payable and more. 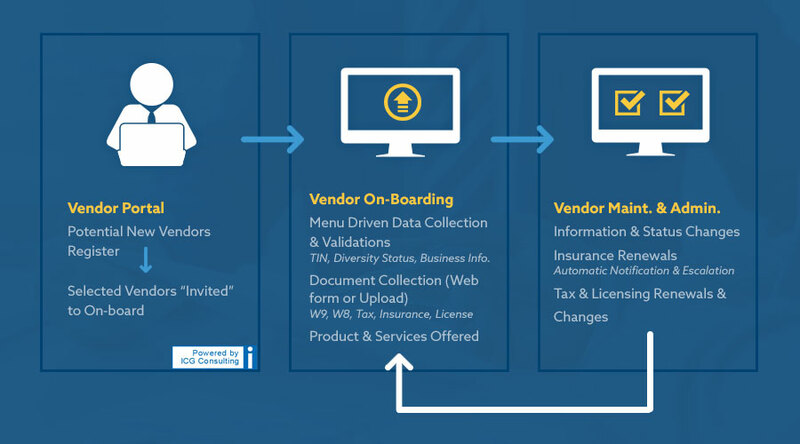 ICG’s Vendor Onboarding solutions can optionally provide back-end workflow components to insure the documents and data are getting to the right people for review and/or approval. ICG can also integrate our onboarding solution to an existing workflow or business process management (BPM) system. A useful component of ICG’s vendor on-boarding solution is the ability to integrate with internal systems (ERP, financial, data management, supply chain, etc.) to update vendor masters and validate information as well as external systems, i.e., TIN Check, D&B, etc. to take advantage of third party resources to establish credit worthiness, validate TIN and SSN numbers of prospective vendors and insure any suppliers do not appear on government watch lists. Once the vendor is on-boarded and doing business, there are also on-going maintenance activities that must take place (such as insurance renewals, licensing and compliance tracking, sales & use tax, etc.). The ICG solution supports all of the ongoing maintenance activities needed to keep vendor information up to date and vendors in compliance. ICG’s portal based vendor on-boarding solution can also provide automatic notifications to you and you vendors when critical expirations are approaching, such as insurance policies, licenses and permits, and other regulatory certifications. Vendor Self-Service: Save money by allowing vendors to electronically submit documents and information for approval and easily update their contact and payment information. File Uploading & Web Forms: Allow vendors or suppliers to upload files and submit web forms that you need as part of the process, i.e W9’s, W8’s, Tax Certificates, COI’s, Insurance Policies, etc. Integrated Workflow Management: The solution provides a workflow component to route documents or obtains approvals from others in your organization. Alternatively, the information can be fed into a workflow system you may already have in place. Automatic Notification & Escalation: Built in notifications to let you know when critical licenses or insurance coverage are about to expire. System can generate automatic escalations to both buyer and supplier resources to prompt corrective action. Configurable Forms & Requirements: You may need more detailed information from your suppliers than just the basic tax, payment and contact information. At ICG, we can tailor the vendor onboarding process with configurable drop-down menus and questions to provide vendor information that is integral for your business. Our vendor onboarding portal is completely configurable so you can capture the information you need for your business. Data Validation: Validate and approve data in real-time. Automated TIN Matching & Validations, validation of diversity status, and other critical data validations. Search Results: Easily viewed and built on the fly using ICG’s extensive search engine, buyers internal users can search vendor results and information in seconds and download that data to build custom reports. Security: Provide stringent information and data security for your vendors and allow electronic signatures for legal documentation. Third Party Punch-outs: Interfaces with third party systems to perform validations and insure your perspective vendor is who they say they are and in good standing. Cloud Hosting: Single-tenant, SaaS type model which ICG hosts and manages in the cloud. What Can ICG Consulting Do for My Business? At ICG Consulting, we have the capabilities to implement a new vendor onboarding and administration portal as either a stand-alone solution or as part of a more complete vendor portal & workflow management system. We understand that every business has difference processes, and that’s why we recommend technologies that make sense for our clients. Creating effective vendor onboarding and administration processes save time-related costs and reduces transaction delays. Let us help you reach your bottom-line. Since we often save companies millions of dollars every year, your investment will pay for itself. Schedule a free demo today or contact us to talk about next steps.